Spice Coast Marathon (SCM) on November 16th and Cochin International Half Marathon (CIHM) on December 7th. This is indeed a big step - a couple of years ago having even one such event was a faraway dream. At the outset, we should mention that we are non-runners - we just run for fitness. 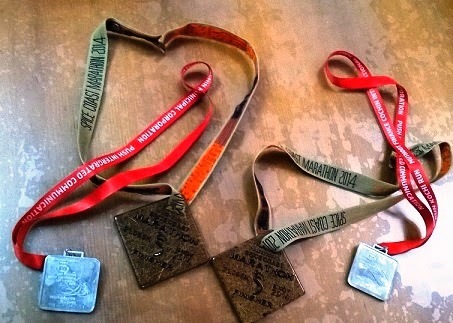 The difference between a runner and a non-runner became crystal clear after participating in these two events - runners regularly push themselves to reach the next level while non-runners are quite happy to be able to keep their weights in check while continuing to enjoy culinary options to the maximum - the less we need to exert to achieve this objective the better! Also, the expectations of these two groups from a race are very different - for runners, the event is all about themselves - PBs (personal best timing), medals, certificates, post-event pampering (food primarily), etc. For non-runners, it is more about the festivities, camaraderie and the quality of entertainment on offer. The two events were a contrast to the extreme in many respects. The race started precisely when it was supposed to. The full marathon was a Boston Qualifier (BQ) event - only a few in India have that designation. The after-run refueling was a proper breakfast. There were several running professionals that offered talks and such during the bib collection event. While on the outside, this appeared a very good gesture, it was again pretty much a farce - although these invitees had obvious marketability (Guinness book, etc. ), their actual reputations were rather spotty. The event was publicized as an eco-conscious effort with even the medals being made of eco-friendly coir - however, the medal ended up being quite unwieldy, size-wise. The execution of the eco aspect of the race was well below par - the most glaring gaffe was a glossy booklet issued as part of the bib packet that explains the heritage sites on the course - an online link to the content would have been ample and would have saved many trees - the content was not copy-edited and hence had numerous errors. A number of portable potties lined the entrance but to most everyone’s chagrin, no water. There was no alternative although the KV (Kendiya Vidyalay - the school whose grounds were used as the starting point) bathrooms were right by the side - the organizers made no effort to get those accessible to the participants. The event started at 5 AM. As we started running, it was fairly dark - the 5AM start was really unnecessary for the half-marathon. We couldn’t find even a single distance marker throughout the course. The volunteers were clueless about their own position in the course and kept feeding us erroneous information. (One of the organizers later told us that their eco-friendly markers were too small to be of any practical use). Medical and potty facilities were missing throughout the course. It is a miracle that nothing undue happened. One of us had a podium finish within our category. To this day there has been no acknowledgement or trophy. Besides, even after three weeks, there is still no way to even download the finisher’s certificate (there is a link which downloads something that looks like an SCM Ad instead of the certificate). As with their 2013 event, the race was an Association of International Marathons and Distance Racers (AIMS) approved event. The course was adjusted this year to accommodate a new start-point but overall it was very similar as last years. For a 20,000+ participant race, the event itself was conducted extremely well and started right on-time. The holding area was crowded as expected but there was room for everyone to do their warm-ups and follow the cues from the professional crew at the podium. Parking also was a breeze and the police force very helpful. The entire course had a number of water stations (water & energy drink) and medical units. The first medical unit was just getting set-up as we passed but as the event progressed they were in action. It was a pleasure to see the folks from the Indian Navy running alongside the rest of us. Their behavior throughout the course was exemplary and is truly a matter of immense national pride. The race was flagged off by Padmasree Mohanlal himself - a nice gesture from his part as the brand ambassador. Quality live entertainment was another big plus this year. Bib collection experience was a negative compared to last year. The papers said it starts at 11AM on the 4th, the emails said 10AM, while the display at the facility said 1PM. The official excuse was that the flight carrying the bibs was delayed. We reached there by noon on the opening day and spend an hour chatting with the volunteers and the people in the queue as the essential ingredient ‘the bib’ was yet to arrive. The race categories were adjusted presumably to encourage senior women runners. But, as with most government stuff, speculation is rife that it was done to help a few select participants. Information sharing improved compared to last year but was still well below par. Downloading the course route with good resolution was an exercise in futility even on the day before the race. While the setup and execution of the race went relatively flawless, the logistics at the finish gave it all away - no acknowledgement, no intimation as to where to obtain the medal and food packet, etc. The real bummer was that they ran out of medals. This led to mass-protests and there were even reports of police man-handling some folks. What a shame! The race was promoted as a people’s run, but the organizers let celebrities and politicians take center-stage while ignoring the participants completely. It was pathetic to see participants finishing the grueling race only to be pushed and shoved at the finish-point. Kochiites can be proud to have hosted two international marathons this year. Truth is, from a participant perspective, both were failures although due to entirely different reasons. While SCM probably met some of the expectations of runners it was a disaster for non-runners. With CIHM, the scenario was the exact reverse - it did meet most of the expectations of non-runners but miserably failed to satisfy runners. SCM claims to cater to runners, but the reality left a lot to be desired. It is an event organized by Soles of Kochi (a runner’s group) and we supported it with our participation mainly because a friend of ours is a founding member. For the success of any event, it is critical that there should be a clearly articulated purpose. SCM had no such purpose and when pressed for the cause gave very vague responses. The last word we heard from our friend was that the managing committee will decide what to do with the profits from the event. This would sound harsh but would lack honesty if left unsaid - Soles of Kochi, the organizers of the SCM event behaves like a cult and already demonstrates several characteristics. The core group has perceived noble goals but is in reality shooting for power, fame, and fortune. The rest are recruits at different levels in the hierarchy. Membership is primarily achieved by presenting an image of invincibility (opportunity to be part of an elite group who can do things very few others can and the chance for runners high), but it is just cult messaging at its best. The core propaganda is that running is a very big deal and running with the group is vital. Come on guys - running is not a big deal at all - anyone can do it - all it takes is practice. It is the right spirit to shoot for power, fame, and fortune in one's pursuits but have the courage to be open about it instead of hiding behind a noble facade. Moreover, there is power-struggle at the top and this contributed to the event’s failures. Money was a big issue probably due to lack of good sponsors. At almost double the CIHM event fee, SCM was not value for time and money. This was probably the main reason why the participation was only around one-twentieth of the participation in CIHM. SCM seemed to cherry pick from the upper echelons of the society rather than catering towards the commoner. This probably backfired as it alienated the vast majority. Given they used a lot of the city’s resources before, during, and after the race, it was only proper for them to at least give back a little - an opportunity to let a few hundred promising youngsters take part in the event for a nominal fee would have been only right. When you come right down to it, the lack of medals/recognition at the end was what made this race a failure. Technically, this can be easily resolved. Hopefully, next year will see a turnaround. When promoting the race as a people’s run, it is extremely critical to try and make it as affordable to the participants as possible. The Rs 200/- fee last year was perfect in this regard but the organizers chose to make it Rs 500/- this year. It would have been better to increase the fee by 25% and focused more on increasing the participation. The marketing effort was well below par compared to last year. The participation could easily double or more with concerted effort. Despite some of the negatives, we consider ourselves lucky to have been able to participate in two half marathons in the space of three weeks in our backyard. The podium finish and the PBs were a bonus. It is amazing that the two events were a contrast to the extreme and it opens up the possibility of what could be, if the organizers of the two events are able to combine/collaborate. We did provide this feedback to SCM six months before the actual event, but the SCM response was disappointing - they did not want CIHM to steal their thunder. Well, now that their maiden event is over, may be it is time to reconsider this aspect. In any case, we conclude wishing the coming years will witness a truly world class event from our beloved Kochi. Cochin International Half Marathon 2013 - A maiden gala event at Kochi.